Virtually all the switches in a typical home are single-pole ones. Double-pole switches are far more common in factories than in homes, but occasionally you might find one acting as a safety shut-off for a residential appliance, a heating system or a spa or hot tub. A double-pole switch is usually a bit larger than a single-pole one, but that isn't just because it has to accommodate two poles instead of one. It's also because the wires feeding electricity to the switch are larger, and this is due to the fact that double-pole switches are usually used to control 240-volt circuits. Two hot wires with a voltage of 240 volts between them feed electricity to residential panels in North America, and most circuits in the house draw power from one or the other of these wires. Circuits using only one hot wire need a neutral wire to complete the circuit, and the voltage between the hot wire and the neutral is 120 volts. The wiring standard was designed to make it possible to use both hot wires to power larger appliances that run more efficiently at 240 volts. 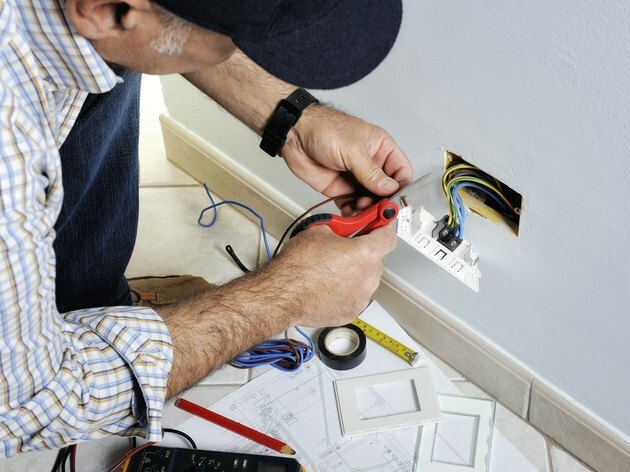 A neutral wire isn't needed because the two hot wires form a complete circuit, but there often is a neutral to operate 120-volt devices such as timers that may be connected to the circuit. If you want to switch a 240-volt circuit, you must interrupt both hot wires at the same time. That's why you need a double-pole switch, which is technically one that controls two circuits. When you wire a switch to a 120-volt circuit, it functions to interrupt a single hot wire. It has only one pole, which is another way of saying it has a single pair of connection terminals. If you examine any single-pole light switch your house, you'll see its two brass terminals and the ground screw. The live hot wire, which is usually black, connects to one terminal, the outgoing hot wire connects to the other one and when the switch is off, the circuit is broken. Because it controls a circuit with two hot wires, a double-pole switch has two sets of brass terminals and a ground screw. If you have one in your house, you'll see four hot wires connected to it: two red and two black. One of the red wires and one of the black wires supply power to the switch, and the other two wires feed the device controlled by the switch. When you flip the switch, power is cut to both circuits simultaneously. Apart from the fact that it accepts two pairs of hot wires, a double-pole switch is different from a single pole one in another important way. It's rated for a higher current. The rating is marked on the switch, and it must be the same as or preferably higher than the current draw for the device it controls. The higher rating means that a double-pole switch has larger terminals to accommodate thicker wires. You wire a double-pole switch in essentially the same way as a single-pole one, but it's important to remember to keep the red wires on one side of the switch and the black wires on the other. If you mix them up, the switch won't work and could be dangerous. Neither a single- or double-pole switch has terminals for neutral wires, which when present are spliced together in the switch box and bypass the switch altogether. Both types of switches have ground screws because they must be connected to a circuit ground wire for safety. How Does a Three-Way Switch Work?